B1A4 Greeted Malaysian BANAs Again After Almost 2 Years! 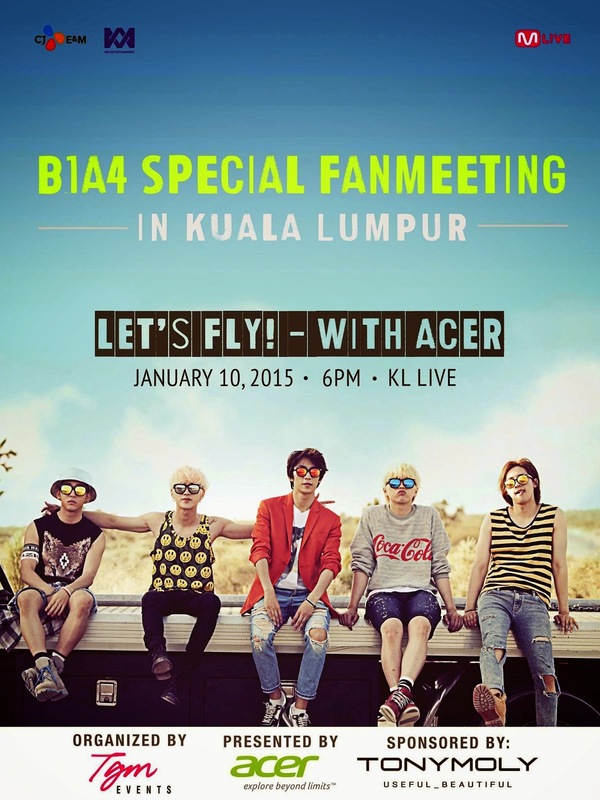 Debuted in 2011, rising star B1A4, which stands for ‘Be the one All for one’, held their first fan meeting in Malaysia, 'Let’s Fly with B1A4 & Acer’ Special Fan Meeting in Kuala Lumpur on 10th January 2015 at KL Live. The South Korean idol group, which consists of five handsome lads (Jinyoung, CNU, Sandeul, Baro and Gongchan), had previously performed in Malaysia for the Mnet Most Amazing Live in Malaysia Concert in 2011, ONE FM’s One Concert in 2012 and even attended the 27th Golden Disk Award which was held at Sepang International Circuit in early 2013. Organized by TGM Events and sponsored by Acer Malaysia and Tonymoly in conjunction with CJ E&M, WM Entertainment and M-Live, the event started at 6PM with VCR of each member’s introduction. The boys kicked off the night with a performance of their debut song, ‘O.K’ followed by ‘Beautiful Target’. Emcee of the night, Bernard Hiew began the interview session by asking the members to introduce themselves to the fans. During the first talk session, Jinyoung stated that they are excited to be able to come to Malaysia and meet their fans. Sandeul then expressed his concern regarding of the recent flood which appeared on the country’s news headline since last month and made sure that their fans are okay by asking them. Next up, the boys resumed the event with the ‘Lonely (없구나)’ and ‘IF... (너만 있으면)’. The boys captivated the fans with their strong vocal performance, accompanied with cool dance choreography which excites their fans throughout the songs! They then continued with Q&A session and game session with fans. Lucky fans were chosen based on the sticky notes that they left on the board before the event started. As the boys caught their breath for a while, Gongchan’s VCR was being played on stage. The stage then continued with a parade of their catchy songs, ‘예뻐 (Pretty)’ and ‘물 한잔 (A Glass of Water)’, followed by their latest hit. ‘Solo Day’. As the event came to an end, B1A4 expressed their gratitude to their beloved fans. Jinyoung said that he was happy to spend their time with Malaysian BANAs. Baro mentioned that they are in the midst of preparing for a new album and earnestly asked the fans to wait for them. Sandeul then said that he wants to stay together forever with their fans! They wrapped up the night with ‘이게 무슨 일이야 (What’s Happening)’ and ‘Baby Goodnight’, followed by the Hi-5 Session with VVIP and VIP ticket holder. B1A4 then performed ‘You’re My Girl’ for the encore stage. The fan meeting was wrapped up with photo session for VVIP ticket holders. The show ended successfully and we would like to specially thank TGM Events for inviting us to an enjoyable event!